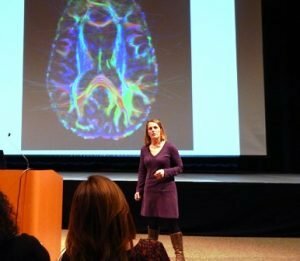 Shrewsbury – Dr.Ruth Potee, a nationally renowned expert on addiction, substance use, and the development of the teenage brain, spoke to concerned parents, educators, school nurses and community members Nov. 16 at Shrewsbury High School. The presentation was sponsored by State Rep. Hannah Kane (R-Shrewsbury) and was hosted by the Shrewsbury Coalition for Addiction Prevention & Education (SCAPE). The talk was preceded by a resource fair with information dealing with addiction, mental health, youth recovery and other support services. The event was attended by Shrewsbury School Superintendent Dr. Joseph Sawyer and his wife, Dr. Laurence Sawyer; Shrewsbury Selectman Beth Casavant, School Committee member Jason Palitsch, Shrewsbury High School Principal Todd Bazydlo, and State Sen. Michael Moore (D-Millbury). “As we continue to fight the opioid epidemic on the local, state and national level, part of our mission here locally is to make sure that we provide parents, youth and community members the information necessary to prevent substance abuse and addiction in our community,” Kane said in her introduction of Potee. Potee spoke for well over an hour in great detail about how and when substance abuse starts. She covered the effects of alcohol and marijuana on the developing adolescent brain and the importance of talking about substance abuse, and family history with one’s children. Shrewsbury Media Connection filmed the event and copies of the presentation can be obtained by contacting General Manager Marc Serra at [email protected].